I hope you've been following along on our fun week of the Painter's Palette Blog Hop sponsored by Paintbrush Studios. Day 1: Fireworks Mini Quilt - Lisa, InspiredbyFabric This is the PaintbrushStudio blog. Visit often! All eight of us received these fat quarters with which to design a project. I didn't use the color French Blue. I did use 5/8 yard of Painter's Palette Solid White! My design is "Patriotic Pinwheel." It's 24-1/2" X 24-1/2" and has a faced (rather than bound) finished edge. *Six pages of instructions do not include specific details for adding the last two borders (white with blue stripe, and dark blue). The 1"-wide (finished) white border is a little tricky to explain where to position, though it can be made similar to the red stripes. Feel free to copy mine on your own. Using EQ7, I came up with this block design. It started as a simple pinwheel block that I changed using the EQ7 "serendipity" feature. For quilting, I first machine-sewed near the seams to stabilize the whole piece. Then I added big stitch hand-quilting because I like it. I used size 8 perle cotton that I have on hand - some Presencia and some DMC - in these four colors. For the dark blue (Patriot) pinwheel, I wanted the appearance of movement, so I turned to my often-used nested acrylic circles to trace curves. Hand quilting was fast and fun! For backing and facing, this old - like from 2008 - print works just fine. It's Robert Kaufman's Satinesque by Patrick Lose. I followed my friend Elizabeth's Faced Binding Tutorial to finish the piece, though instead of a double layer folded facing, I cut mine to make a 2"-wide single layer facing. Tip: Rather than hand sewing down the facing, for a quicker finish use Stitch Witchery to fuse the facing to the backing. Wa-la! My hand quilting shows up a little. For a chance to win from FlourishingPalms, just comment. Sorry, but this giveaway is for USA residents only. Be sure to include your email address if you're a no-reply commenter. If I can't contact you, you won't be the winner. And let me add that if you don't win, go buy some Painter's Palette Solids anyway! After my first yardage purchase of it at QuiltCon in Savannah, I've been completely sold. The hand is fabulous. Not as heavy as some solids; nor as light as others. The colors - all 168 of them! - are yummy. The colors don't bleed. I'm a pre-washer, so it was wonderful to see a color catcher go into and come out of the washing machine still the same color. Paintbrush Studio is in North Kansas City. I have a soft spot for that area because many family members live in KC. What a fun design for a table topper! And those solids don't bleed - definitely a winner. I've always tended to shy away from reds and deep blues with white just because the white always catches all the color bleeds. What some fun ideas! I do love some solids to build in my stash. Great block and quiltlet. I so enjoy seeing your work, but rarely comment. That's a lovely design-great use of those fabrics! Wonderful! Love your little project! And those nested acrylic circles! Tell me more! Here's information on nested circles... Mine are 1/8" thick which is meant for designing and drawing. On the Quilter's Rule website it's $27.50 for a set of circles from 1"-11-1/2". If you prefer thicker templates, perhaps for home machine quilting, a 1/4"-thick set (sizes 1"-11-1/2") is $55. Linda.... I love your nested circles. I have never seen them before, but as soon as I hit publish I'm going to look for them. Beautiful project. 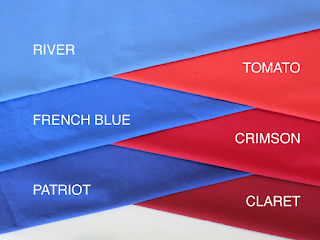 I've wanted to make 4th of July placemats for so long and this bundle would be perfect to get that checked off my list! This project was a perfect one for hand-stitching as you travel. I need to keep that in mind...it turned out perfectly! Love your block design. I need to try big stitch hand guilting. This is a lovely way to make the pinwheel look modern. I'm trying to put more solids in my stash so appreciate hearing how these sew up. 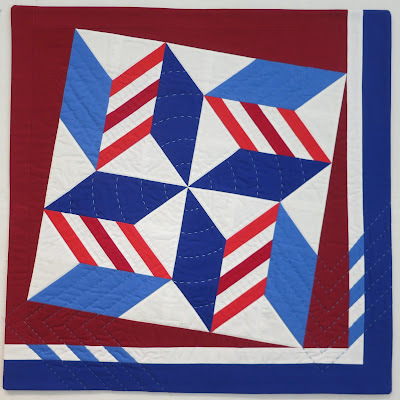 Thank you for sharing your Patriotic Pinwheel Mini with us! I think this will make a wonderful table topper. I am sure hoping to win a bundle of these fat quarters. With the way they are talked about, I want to try them! Thank you for the opportunity and have a great day! this is so lovely. this would make a fun pillow. THANK YOU for a neat project idea!Love it! This pattern would make a great Quilt of Valor! I love your creation!! Thank you. I love the hand quilting you added. What a beauty. I love red, white and blue combinations so especially enjoyed seeing this. What a lovely mini! Hand quilting is a wonderful touch. Great mini! I love how you traced the curves! Lovely! Your tutorials are always so fluent and easy to follow! Happy Freedom weekend to you. very nice, i think the french blue is my favorite but i do tend to lean towards blue in general. I love everything about this. 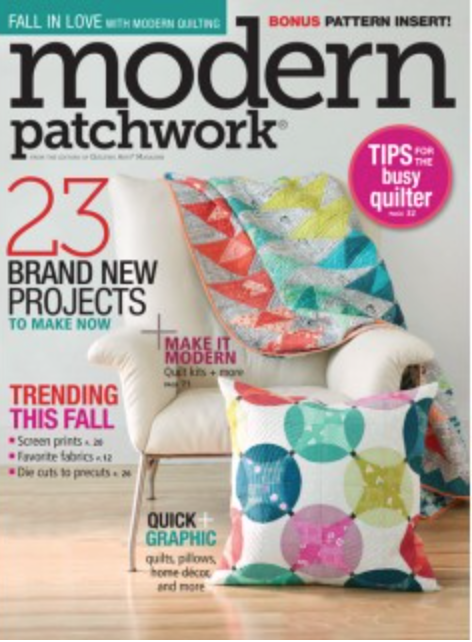 Big quilting by hand is on my to do list this summer! I love your quilting! The block is cool too---but I really love your quilting. Clever quilting design on your patriotic block. Love your colors. Love how you have this set off-kilter, and with the circular quilting - perfect! I have some fall color Paintbrush Studio - really lovely feel on this fabric. Thanks for the chance to win! Linda, clever to make the stripes to go alongwith the star! And the hand quilting takes to a new level! Great job! Thanks for the info on the nested circles. They look very useful! Love the nested circles for guides! I would have never thought of that. Thanks for the inspiration! I should have known you hand-quilt as well as you machine-quilt. It is beautiful! Very nice design and thank you for the idea of using those circle templates in a new way! Great mini, love the hand quilting. I love your mini quilt. This design would be great repeated in several blocks to make a quilt of valor. Love this block! And thank you for supplying such a nice pdf tutorial. Can you tell me where I can get acrylic circles like what you used? Thank you. And thanks for the opportunity to win. Love your pattern. It's sew cute! Thanks for the chance to win! Wow! This is so cute! It's a need to make item for sure! It will go on my wall and stay there year round with the rest of my minis. I love the circle templates! Very cute project! Very pretty. Thank you for sharing your detailed tutorial. As always, your block is original and stunning. Those acrylic circles are a must have! I like your design--fabrics are nice. 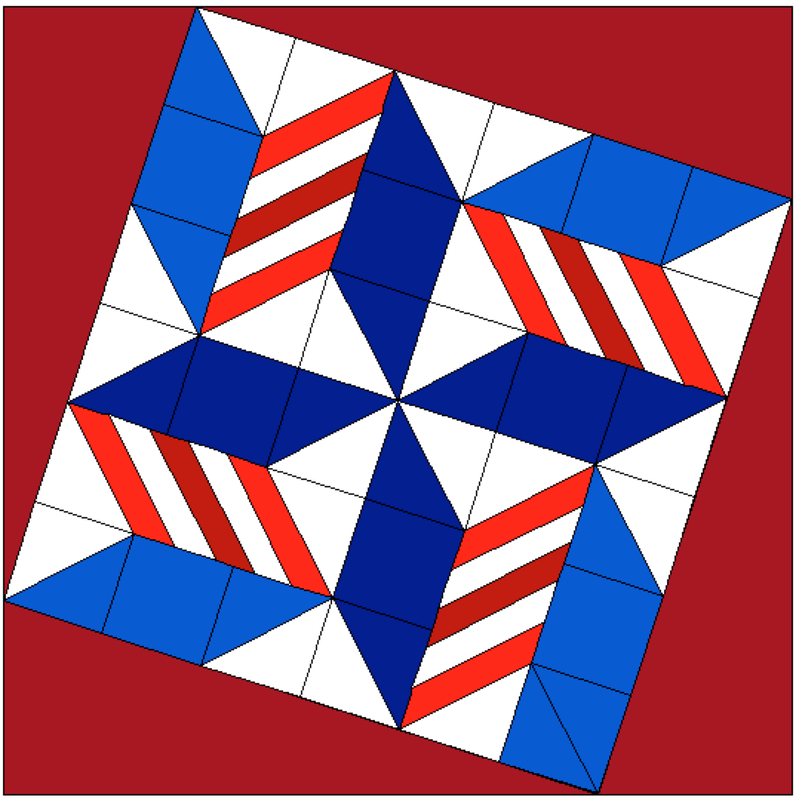 I really like your Patriotic Pinwheel and could just imagine more of them in a Quilt of Valor. Thanks for the tutorial! Sweet quilt and great post explaining the steps. I was steered to these new solids by Brenda at Pink Castle Fabrics. They are wonderful! I've just started playing with EQ7. Struggling a bit but as with anything practice makes perfect and already I'm getting more comfortable with the buttons and manipulating them. Happy 4th!!! Fun piece. The hand quilting is my favorite part. What a great design! 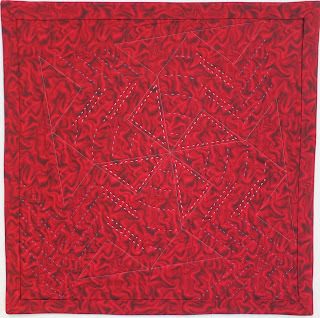 I love the movement and the hand quilting is just perfect! Your pinwheel is striking! and with it's generous 24 inch size, you could easily make a big quilt out of it. Thanks! I was following all week, on Chrome, and just realized this morning that none of my comments were allowed to post from there. =P Your pinwheel is great! The hand quilting gave it so much texture, and I loved seeing hand quilting on it. Thanks for the free download pattern. Nice easy to follow instructions. You never disappoint, Linda! This is a fun and festive block! Great job Linda. And I love the big stitch. What a great patriotic block! Just awesome! Such a fun and fabulous design for patriotic holidays. I also love that you hand quilted it. I love your beautiful block! And the quilting is perfect!! Centerstreetquilts at Gmail dot com. 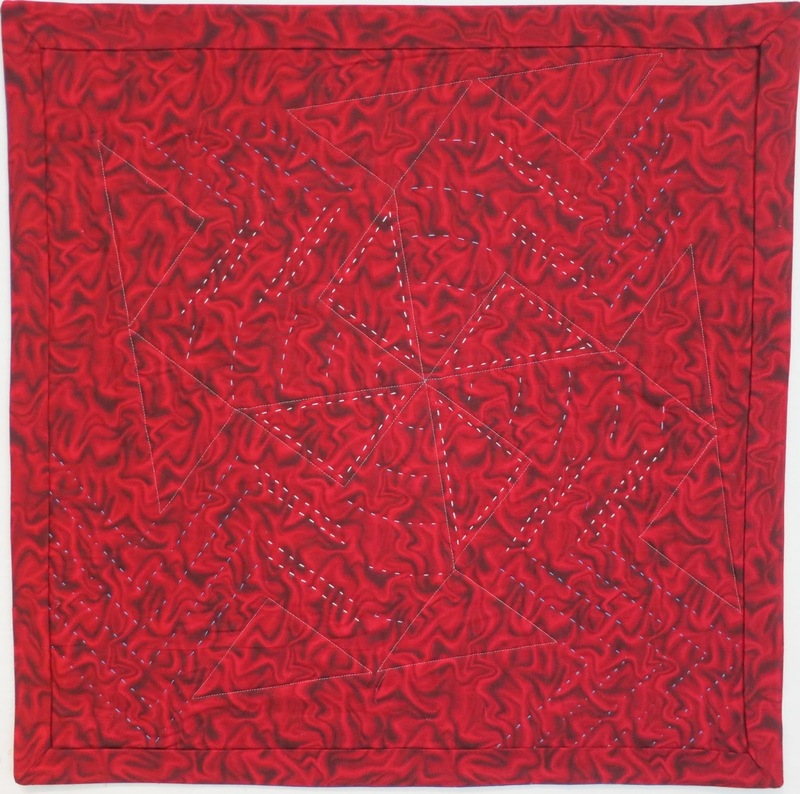 I love the hand-quilting pinwheel design you did.